Deputy Foreign Minister: Netanyahu would give 86% of Judea and Samaria to the PA, but luckily they will never settle for that. 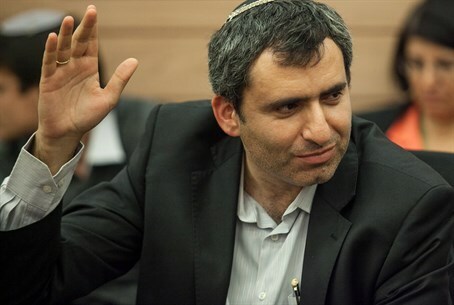 Deputy Foreign Minister Zeev Elkin (Likud) believes that Prime Minister Binyamin Netanyahu would be willing to give more than 80% of Judea and Samaria to the Palestinian Authority as part of a future peace agreement. In an interview with the Maariv daily newspaper which was published on Friday, Elkin said that former Prime Minister Ariel Sharon had spoken with the PA about Israel keeping 14% of the so-called “settlement blocs” and handing the remaining 86%. The PA refused, he noted, but that is in fact what saved Israel because, he predicted, if they would ever agree to such an arrangement, Netanyahu would go for it. Such an agreement, said Elkin, would mean evicting some 70,000 Jews who reside beyond the “settlement blocs” from their homes. “Isolated communities like Yitzhar, Itamar or Tapuach will face a difficult choice in such a case," he added. "I say that if the Palestinians, G-d forbid, will become flexible and go for it, we will get the worst agreement possible. Upon receiving 86% of the land, they will establish a terrorist state," said Elkin. He added that he does not trust the Arabs that their Palestinian state, under such an agreement, would be demilitarized, since the PA cannot be trusted to keep their part of an agreement. "Agreement? What agreement? They have agreements? They pledged not to unilaterally turn to the United Nations. It is enshrined in the Oslo Accords. Did that stop them?" Elkin told Maariv, rejecting the notion that Israel would be safe from a Palestinian state in Judea and Samaria because it would be surrounding this state. “We also surround Gaza. Kfar Saba will become Sderot [under such an agreement],” he said. "There will be no real compromise,” he predicted. “The Palestinians will insist on getting everything, and then either we’ll give up or everything will blow up." The Arabs “will not move an inch. Half of them, that’s Hamas, want to throw you into the sea. The other half is ready to talk to you under the conditions of the pre-1967 borders with minor modifications, threads of Jewish settlement, a division of Jerusalem and the right of return. None of them would be willing to give you 14 percent of the land,” noted Elkin.